This August 2016 as both Pakistan and Singapore prepare to celebrate their Independence Days, FUCHSIA Magazine, in collaboration with Arif Habib Limited, launches ‘DREAM BIG’. DREAM BIG aims to strengthen and promote ties between the two countries by providing a platform for budding Pakistani entrepreneurs to gain international exposure to the Singapore market. 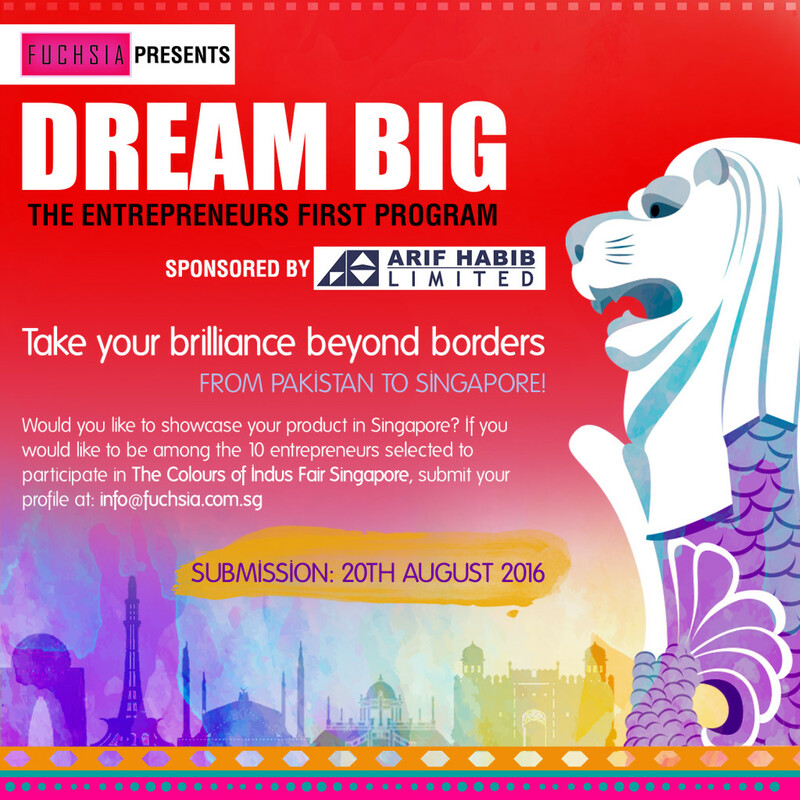 DREAM BIG is a program where 10 entrepreneurs from Pakistan will be selected and sponsored to participate at The Colors Of Indus Fair in Singapore. The colors Of Indus Fair will be held on 29th September in Singapore at the Novotel Hotel, Clarke Quay. Sponsorship includes airfare and stay in Singapore. Interested participants must apply before 20th August (please see the form at the bottom). Finalists will be announced by 28th August, so visas and all other arrangements can be made in time for participants to be in Singapore before 29th September. Terms & conditions apply to a successful application. You are probably thinking: Am I eligible to apply for ‘DREAM BIG‘ ? If you are an entrepreneur and believe that your product should be showcased internationally, then apply for DREAM BIG. We are looking for lifestyle products including clothing, footwear, jewellery, home accessories, or any new and innovative ideas that you feel are guaranteed to ‘wow’ the international markets! If you feel your business fits the above criteria and your ideas and designs incorporate quality, originality and innovation, and represent a superior Pakistani craftsmanship then apply for DREAM BIG. For more details, please email us at info@fuchsia.com.sg. You can also simply fill in the ‘DREAM BIG’ application form, given at the bottom of this page, to be submitted no later than August 20th 2016. Once you have applied, you will be sent details on the stall sizes and rates. Arif Habib Limited is one of the leading Brokerage and Financial Services firm in Pakistan. Sharing FUCHSIA Magazine’s vision to strengthen the bond between Pakistan and Singapore, Arif Habib Limited came on board to sponsor 10 entrepreneurs from Pakistan. Arif Habib Limited believes in the entrepreneurial spirit that exists amongst the youth of Pakistan and would like to support these enterprising individuals. Such programs not only offer exposure to new businesses but also showcase Pakistan as a possible market to source various products and services in the future. For further information about Arif Habib Limited, please click here. The Colors of Indus Fair is the only Pakistani Fair in Singapore that aims to promote and create a market for Pakistani lifestyle products in Singapore. It takes place twice a year (March & September) and is hugely popular amongst expat Pakistanis and Indians, as well as the local South Asian community. There are approximately 50 to 70 participating vendors at each Colors of Indus Fair, experiencing a footfall of over 1000 people. The Colors Of Indus Fair is committed to providing a platform for an exploration of entrepreneurial spirit. From this year, Colors Of Indus Fair goes one step further, featuring 10 entrepreneurs from Pakistan, and giving them an opportunity to hone their business acumen in Singapore. For further information on The Colors of Indus Fair, please click here. Family back ground: Give us a brief summary about the number of immediate family members, your father's work/ profession. Are you the bread earner of the family? If approved, will be you be travelling yourself or a member of your team will be sent. If you will not be travelling yourself, then please ask the team member to fill in a seperate form as well, and send it along with your form, mentioning you as the primary applicant. In 5-6 lines, please tell us what is so unique or outstanding about your product that it should be selected for The Dream Big Program.